Net earnings of the four largest NZX companies — Auckland International Airport, Meridian Energy, Fisher & Paykel Healthcare and a2 Milk — were only $855m for the latest year compared with $5128m for the four banks. Net earnings for the next six largest NZX companies — Spark New Zealand, Ryman Healthcare, Fletcher Building, Mercury NZ, Contact Energy and Port of Tauranga — were $838m for the 2018 financial year. Thus, net earnings for the 10 largest NZX companies in the 2017/18 year were $1693m, one third of the four largest banks. Looking at it another way, the 10 largest NZX companies reported aggregate net earnings 15 per cent below the $1986m achieved by ANZ Bank New Zealand. ANZ Bank New Zealand is a massive cash cow compared with most NZ companies but ASB Bank, Bank of New Zealand, and Westpac New Zealand aren’t far behind. These four banks also dominate the banking sector with a combined market share of 82.7 per cent, with ANZ having a 32.5 per cent share, ASB 20.4 per cent, Westpac 15.0 per cent and BNZ 14.8 per cent. The next largest banks are Kiwibank, with a 7.2 per cent market share, TSB Bank (3.6 per cent), Southland Building Society (1.7 per cent), Rabobank New Zealand (1.6 per cent), Heartland Bank (1.3 per cent), and The Co-operative Bank (1.3 per cent). Kiwibank, TSB Bank, Southland Building Society, Heartland Bank and The Co-operative Bank, with a combined market share of 15.1 per cent, are the only New Zealand-owned banks. 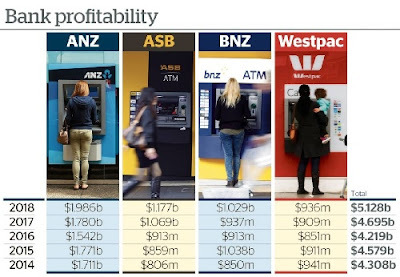 These NZ-owned banks are much smaller in terms of profitability with Kiwibank reporting net earnings after tax of $115m for the June 2018 year, TSB Bank $52m, Southland Building Society $27m, Heartland Bank $68m and The Co-operative Bank $10m. Big is best as far as profitability is concerned as the four largest banks had $62m of net earnings per 1 per cent market share, while the five NZ-owned banks had only $18m of net earnings per 1 per cent market share. The Big Four use their massive banking sector dominance to move into other areas, including KiwiSaver. The four Australian parent companies of the NZ banks — ANZ, Commonwealth Bank (CBA), National Australia Bank (NAB) and Westpac — also have a dominant position across the Tasman with a combined market share of 78.0 per cent. This is slightly lower than the 82.7 per cent market share of their NZ subsidiaries. Overseas ownership of our four major banks is a huge loss to the economy in terms of the dividends remitted overseas and the finance sectors’ under representation on the NZX. The MSCI World Index has a 16.3 per cent weighting to the financials with JPMorgan Chase and Bank of America included in the index’s top 10 companies. By comparison Heartland, which is the only domestic-owned bank listed on the NZX, has a sharemarket value of $0.9b or just 0.6 per cent of the NZX’s total value. The four Australia-owned banks would have a combined NZX value between $60b and $70b if they were listed on the domestic sharemarket. This would be a huge boost to the NZX as it has a current value of only $135b. But that is not the case even though ANZ New Zealand was listed on the NZX between 1980 and 1986, Bank of New Zealand was listed between 1987 and 1992, and ASB was fully owned by ASB Community Trust. They were all sold to Australian interests for a fraction of their current value. The release of the Financial Markets Authority (FMA) and Reserve Bank of New Zealand (RBNZ) inquiry into the banks was awaited with interest because of the sector’s commercial dominance and massive profitability. The report, “Bank Conduct and Culture. Findings from an FMA and RBNZ review of conduct and culture in New Zealand retail banks”, was released earlier this week. However, two statements in the report indicated it would take a relatively light-handed approach to the subject. When a regulator writes that it has no “direct legislative mandate” then this analysis will be light, particularly in relation to large banks because they have substantial legal resources to challenge these reviews. The second comment was: “The review was not an audit of individual files or accounts, or a detailed investigation of historical cases like that of the Australian Royal Commission into Misconduct in the Banking, Superannuation and Financial Services Industry”. This statement also gave a clear indication that the FMA and RBNZ was taking a much lighter approach to its bank conduct and culture assessment than the Australian Royal Commission. This issue has been a major focus of the Australian Royal Commission but the FMA/RBNZ adopted a softer approach. One of the obvious areas of conflict is KiwiSaver and the ability of the banks to use their distribution to capture huge market shares. The four major banks and Kiwibank had a 64.2 per cent share of total KiwiSaver funds of $50.8b at the end of June. Simplicity’s Sam Stubbs is a huge critic of the banks’ strong market position but these major banks continue to attract more and more KiwiSaver funds. Since the end of 2017, ANZ has increased its KiwiSaver funds by $1289m, ASB by $1055m, Westpac $623m, Kiwibank $489m, BNZ $306m and Simplicity $193m. Simplicity has made good progress but it is extremely difficult to compete against the banks because of their huge financial resources and substantial distribution capabilities. Considering these, it seems inconsistent that the Commerce Commission approved the merger between ANZ Banking Group (New Zealand) and The National Bank of New Zealand, two hugely profitable banks with strong market positions, where it rejected the merger between NZME and Stuff, two media companies struggling against fierce international competition. The main conclusions are that the four major Australian-owned banks have a charmed life in New Zealand. This enables them to report huge profits and successfully fight off smaller competitors. Brian Gaynor is Head of Investments at Milford Asset Management. This article first appeared in the NZ Herald.